Please check out the blog page for lake temperatures. Dust off the old tackle box, because there is plenty of fishing for experienced anglers and beginners at Jenkinson Lake! The store at Sly Park Resort www.slyparkresort.com across the street from the park entrance is taking donations to stock the lake, please stop by and throw in a buck or two and help keep the fish jumpin'. Fishing Licenses are availble at CVS next to Safeway on the corner of Pony Express and Sly Park Rd. German Browns (These fish are not restocked). Thanks. 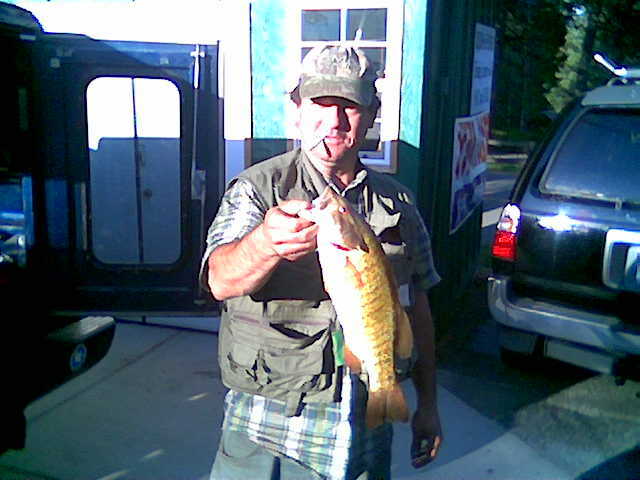 Jerry wrote: I caught that (picture above, left) on 4 lb. test line and something that looked silver like a Kastmaster. "This fish had me shaking like a leaf when I hooked into it. took me about 25-30 min. to get her in." 6/12 No one reported any catches for June, don't forget to take your catch to Sly Park Resort, and have it recorded. 4/10/12 Rocco 1.25lb 16" German Brown, Power Bait. 4/4/12 Abe A. 3.25lb 16", Smally Worm. 3/30/12 Rick A. 1.75lb 20" Macinaw, Shore Crawler. 3/7/12 Bill E. 5lb 24.5" Macinaw, Trolling. 2/23/12 Abe A 2.5lb Macinaw. 5/4/11 David F. 5lb 26" German Brown. 5/2/11 Eric Y. 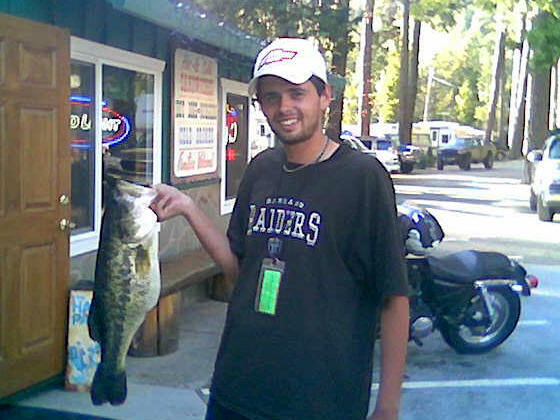 3.2lb Large Mouth Bass. 5/1/11 Jim the Painter 21lb 15oz German Brown. 4/28/11 BoJo 21" 3lb German Brown, caught using Kastmaster. 4/28/11 Department of Fish and Game Trout Plant (750lbs at ~1lb ea.). 3/28/11 Department of Fish and Game Trout Plant (1000lbs). 3/12/11 Mallory D. 21" 2.75lb Macinaw, caught with spinner. 3/11/11 Mike C. 20" 3.8lb Macinaw, caught with worms at the 2nd Dam. 3/08/11 Department of Fish and Game Rainbow Trout Plant (750lbs at ~1.5lb ea). 1/23/11 Valerie N. 20' 4lb Macinaw, caught with power bait. 2/7/11 Aaron D. 20" 4lb Macinaw, caught with jig. 1/24/11 Department of Fish and Game Trout Plant. 1/19/11 Department of Fish and Game Trout Plant. Check out this awsome slide show of Jenkinson Lake taken by George Nejmantowicz. Copyright © 2011 Sierra's Best. All Rights Reserved.